With the rapid growth of China's economy, the construction of highway tunnels is increasing with each passing day. In recent years, the annual growth rate of road tunnels in China has reached 20%. As of the end of 2017, there were 16229 national road tunnels--15.2581 million meters, an increase of 1048 tunnels--1,245,400 meters compared with last year, including 902 special long tunnels-- 4,103,200 meters, and 3,841 long tunnels--6,599,300 meters. China has become the country with the the longest mileage of tunnel construction in the world. Due to space constraints, when a traffic accident occurs in a tunnel, the rescue will be relatively difficult, and it is easy to cause a secondary accident, which causes the highway section to be blocked. Moreover, the environmental conditions in the tunnel are complicated, and the exhaust gas, oil, and dust emitted by various vehicles cannot be dispersed in time. All of the above results in low efficiency and high false positive rate of detection equipments in the tunnel, which causes a "wolf coming" effect. 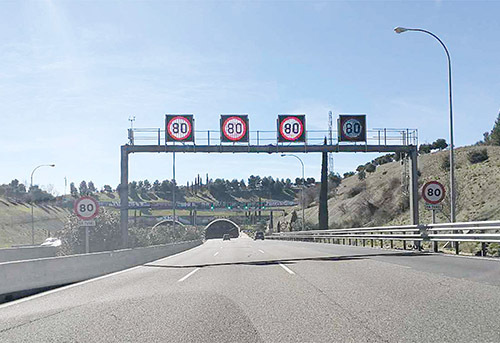 The monitoring of the tunnel operation safety situation and the emergency response capability of traffic incidents depend on the accuracy and real-time performance of the traffic situational awareness. HYTECH INC’s system product can performance well whether it is dark adaptation, light adaptation and other lighting conditions, or encounter any abnormal traffic events, such as vehicle failure, night parking , pedestrians, or rear-end, congestion and other anomalous events, as well as tunnel fires and other tunnel emergency situations, the monitoring center will get real-time monitoring and alarms of <1 false rate every 24 hours. In addition, the system can use the advanced WSDR millimeter-wave radar technology to pre-disaster warning of tunnel fires before the fire detection system sensors. The radar can detect the emergency deceleration, parking, overspeed, collision, etc. of the pre-disaster vehicle in real time, and send the alarm information to the management personnel for the first time, providing the earliest time window for event processing and rescue, and can penetrate invisible obstacles like smoke and deflagration, to accurately locate the real-time running status of trapped pedestrians and vehicles. HYTECH can provide best solution for tunnel operation safety and emergency rescue. When the alarm is triggered, the system automatically issues the abnormal events to the driver and passenger through variable information signs, variable speed limit signs, lane indication signs, etc. to realize the induction and regulation of the vehicle speed and traffic flow to increase the road capacity, reduce traffic congestion and prevent secondary and multiple accidents.